PLEASE REFER TO FISHWATCH FOR RELIABLE INFORMATION AND UPDATES ON COD + SUSTAINABILITY. If you research recipes often, you already know there’s no shortage of dishes that call for wine. So, a few years ago–likely in a state of boredom–I started swapping wine for beer and very quickly learned that the substitution is bomb. It even works in “fancier” dishes like risotto! Beer has become my go-to whenever I want to bring some excitement to a recipe. Though more often used to spruce up beef, pork, and poultry, it can work really well with fish. Cod is a meaty and flaky white fish that is light in flavor, easy to work with and compatible with a variety of ingredients. People tend to lean more toward bright and citrusy flavors when preparing white fish, but when you live a pescetarian lifestyle, you need to think outside the box in order to give yourself some variety. I adapted this recipe from a cod recipe that called for vermouth. I’m sure the vermouth would make for a great dish, but I’m a sucker for beer and mushrooms together, so again, I tampered with a recipe to make room for beer. In a large saucepan or skillet, melt 3 tablespoons of butter over moderate heat. Add the mushrooms and simmer for 5 to 7 minutes, until tender. Stir occasionally. Add the garlic and simmer until fragrant, approx. 30 seconds. Slowly add the beer, the chopped parsley, the balsamic vinegar, salt, and pepper. Bring to a boil and cook until liquid is reduced by half, approx. 2 minutes. Lightly season the cod with salt and pepper. Place the fillets into the pan. Spoon some of the sauce and mushrooms on top of the fillets. Place the pan back onto the stove over moderate heat and bring to a simmer. Cover, reduce heat to medium-low, and simmer until cooked through (internal temp of 145 degrees F), approx. 7 to 10 minutes. With a slotted spoon or spatula, carefully transfer the fish to serving plates. Over low heat, whisk the remaining butter into the sauce until melted. Spoon the sauce and mushrooms over the fish and garnish with a bit of fresh chopped parsley. Dana, I have to agree with you. Beer has never failed me either! Haha I literally almost spewed coffee all over my screen! This recipe looks amazing and I want it. I love your use of beer in this recipe. Beer can totally be used like wine in dishes and you've inspired me to do just that! Oh, and I love your photo's! I love the look of this dish, especially the cod. 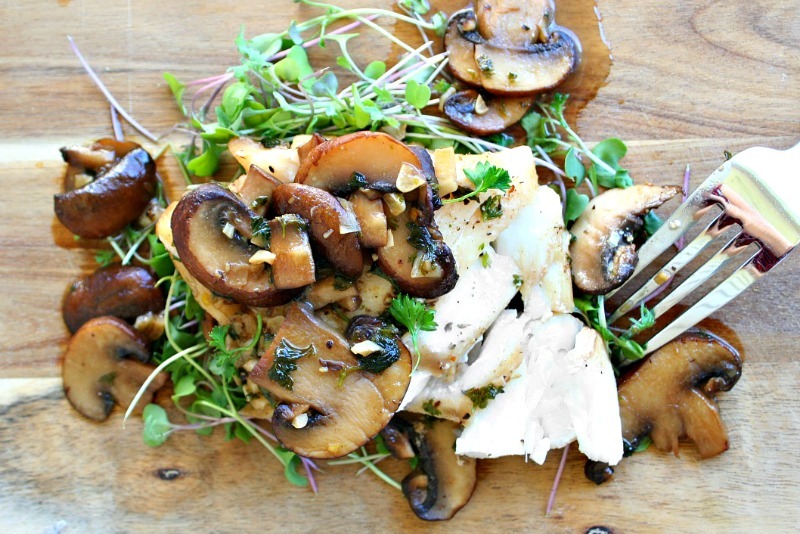 I've never thought about pairing mushrooms with cod before, great idea! I've never cooked with beer and fish (besides beer battered fish) and I feel as though that has been a complete fail - I also like that you have mushrooms in there as beer and mushrooms have to be one of my favourite flavour combos. Wow! Sounds delicious! My mom used to make a mushroom sauce when we were small, but I don't recall beer in it. I'm pretty sure indeed there was never any ???? ????. This dish looks great! Love the pictures too, thanks for sharing! Ok the photography here is just incredible!!! Also love the micro greens! !